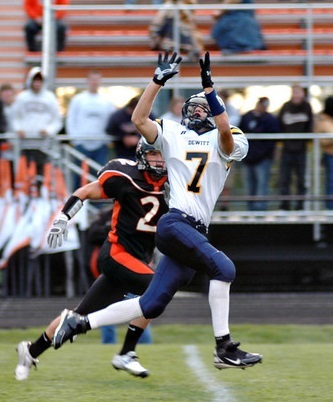 Jason was named to the Associated Press Class B team in 2007. Jason had an incredible senior season with DeWitt and was surrounded by other talented receivers. The fleet footed Fleet dazzled the large crowds with a number of acrobatic catches during the season and was one of mid-Michigan’s most versatile and exciting players. His 66 receptions, 1,302 yards and 19 TDs are all on the State season record books. Jason also picked off seven passes which he returned two for touchdowns. He also returned eight kickoffs for a gaudy 29 yards per return and one touchdown. He honored DeWitt by being named to the 2008 All-Star game played at Spartan Stadium. Jason went on to play college football at Saginaw Valley State University.